Another unusual feat of homemade technical wizardry from filmmaker Standish Lawder, whose coffee can contact printer can be viewed elsewhere on this blog. 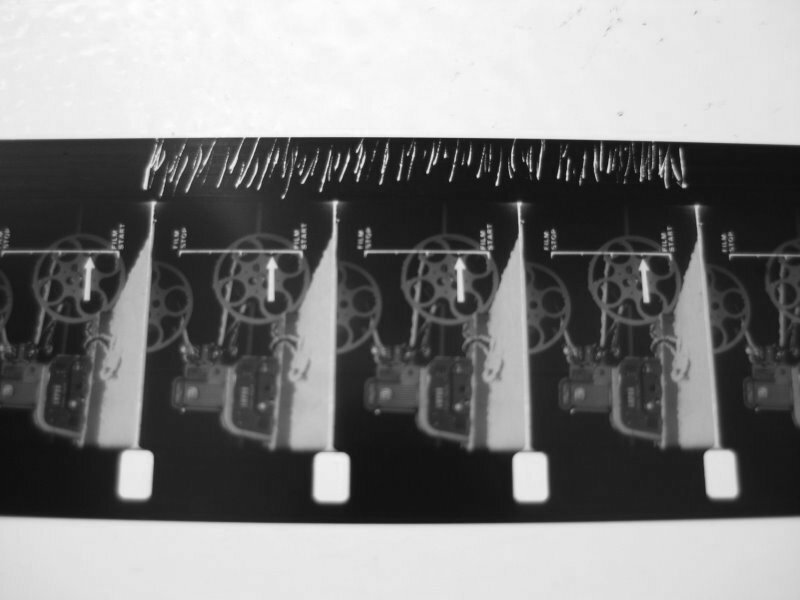 When Standish made the film Specific Gravity (ca.1969-70), he only struck one print, and decided to give it a minimal soundtrack by scratching some sound onto the track area of the print (one instance of which is pictured above). This is the only print ever made, and technically the only place the soundtrack exists. When the time comes to preserve this film, I’m happy to say that Standish already gave his permission for me to replicate the scratching on the new prints. I know I could digitally capture the track off of this print and actually make a new soundtrack negative, but that just doesn’t seem right. By the way, as already evidenced here and by his coffee can printer, Standish was one of the more technically self-sufficient experimental filmmakers out there, and sometime around 1970 or 1971, he even obtained a (real) contact printer on which he made his own release prints for his films. All the original release prints for films like Colorfilm, Intolerance (Abridged), and Regeneration were made personally by Standish on his own printer.